I love a cookie or candy with crunchy wafers in it, so Kit Kats are right up my alley. Concentrating on the texture, I was very pleased with most of these, both of the tiramisu-flavor sticks especially. They are nicely delicate and have just the right proportion of wafer to coating and filling. The azuki was my least favorite. I swear, I try so hard to like red bean sweets. I like nearly everything else about Japanese food, and I know that my dessert pleasure is sorely limited if I don’t like red bean. The filling in this doesn’t have the texture of bean, and it’s often the presence of actual beans in a dessert that I find off-putting. But unfortunately it turns out that’s not all there is to it. Sorry, Kit Kat, I am sure it’s not your fault that I don’t like red bean combined with chocolate either. I was much happier with the Tiramisu. If Kit-Kat makes you think ‘chocolate,’ be aware that there’s little chocolate in this – the wafer filling has a mild version of the chocolate-coffee flavor elements of a tiramisu, and the coating is white and creamy. I can’t decide if it tastes slightly cheesy like a tiramisu should, but in the end I decided I don’t care. In contrast to my troubled relationship with azuki, I am madly in love with green tea flavor sweets. So although Green Tea Tiramisu struck the purist in me as terrifyingly multicultural, I was most looking forward to this one, and it didn’t let me down. I’m not sure how much tiramisu-flavor is really in this, but it it’s one of those things with the sort of distinctive but mild green tea flavor that I find perfectly dreamy (and I don’t think I’ve every written that word to describe anything else in my entire life). It’s good that this was packaged in small pieces or I would not have known when to stop. I will note that I got two second opinions on these, and both test subjects – including one who is almost as big a Japanophile as I am – preferred the plain tiramisu to the green tea. Well, good, more for me! I can’t argue with that although, it’s not like that is a bad thing, right? These were definitely not bad if you like white, creamy, and sweet, which I do. They are not as exciting as green tea, but what is? Let’s just say I had no trouble eating the whole bag. 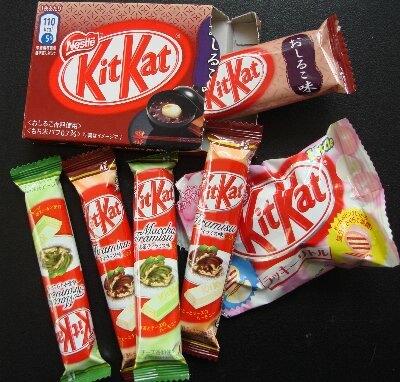 Although these different flavors were successful to varying degrees for me, the whole exotic flavored Kit Kat concept gets two thumbs up from me. I am usually extremely skeptical about newfangled variations on old classic things, but this is totally an exception – I can’t wait to see what they think up next. I literally just got back from Japan, and I was sorely tempted this morning by thee Tokyo-limited soy sauce Kit Kat at Narita airport, but the box was so huge, they got nixed in favor of more Hi-Chews. I’m an adventurous eater, but I think I probably made the right choice. Oh, that sounds horrible! I wish I could try one. I always want to like the green tea flavored candies, but the flavor tastes kind of powdery to me. stephen, if you’re trying Japanese green tea candies, that’s because Japanese matcha is literally green tea powder. It’s pretty intense and rather bitter stuff, but I personally find it pleasant.